Wallabies fullback Israel Folau has rejected a short-term contract, understood to be worth A$500,000 (NZ$560,000), to play in Japan. Instead, opting to spend some much needed time with his fiancee, Silver Ferns star Maria Tutaia. Folau, who earns more than A$1 million (NZ$1.1m) annually on his ARU contract, was set to join Japan's cashed up Panasonic Wild Knights team under former Wallabies coach Robbie Deans as part of a clause in his deal, according to the Daily Telegraph. "We're both just having time off, we haven't figured out a wedding date yet, but it's pretty hard at the moment because of our seasons," Folau told the Daily Telegraph. "We're not in a rush to get things done, we're just really trying to enjoy our time together because we don't get a lot of that together." 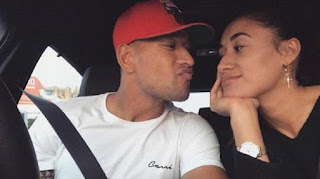 Folau, who will take a break from all rugby after taking on the Barbarians this weekend, also revealed how important Tutaia, one of New Zealand's leading sportswomen, has been in his life. "Early on in the relationship I knew she was the one," he said. "It was a feeling I've never had before in previous relationships. "She's been really good for me, really supportive - from afar obviously - but she has been great.